Starfish exhibit a complex lifecycle, in which the young pass through two developmental stages before settling down on the ocean floor and becoming mature adults. While certain starfish species adapt successfully as aquarium pets, very few starfish are propagated in captivity. Accordingly, aquarists are only likely to observe adults in captive environments, although you may notice your starfish -- also called sea stars -- releasing eggs or sperm into the water column. Starfish engage in external fertilization through a process known as spawning. To spawn, male and female starfish release eggs and sperm from their bodies. Some of the sperm and eggs contact each other, initiating fertilization and development. When spawning, many starfish adopt arched body postures, with the center of their bodies raised high off the substrate. You may see the released gametes in the water, as they will form a milky, white cloud in the water. Some species exhibit seasonal breeding habits, although it may be possible to observe spawning at any time of year. Various starfish exhibit different developmental patterns, yet most follow the same general theme. After the gametes fertilize each other, they quickly become bilaterally symmetrical larvae, called bipinnaria. These tiny creatures feed on smaller planktonic organisms and float about for a few days or weeks before transforming into non-feeding, larvae called brachiolaria, which settle on the ocean floor. Once the brachiolaria settle in an appropriate habitat, they develop radial symmetry and begin metamorphosing into adults. There is some evidence to suggest that the larvae seek out areas with adult pheromones, which may signal to the larvae that the habitat is suitable. After assuming their characteristic shape, the starfish begin growing to attain adult size. In addition to sexual reproduction, some starfish species can reproduce asexually. This is often a response to an unfortunate situation, rather than a deliberate method of reproduction. Many species can regenerate arms lost to battles with predators. And in some cases, detached arms can regenerate their bodies and become fully functioning organisms. A few starfish species possess both male and female reproductive organs. Such specimens are capable of self-fertilization. These bisexual species sometimes brood their developing young, which may be related to the fact that most such species live in areas in which the conditions do not favor the development of free-floating larvae. 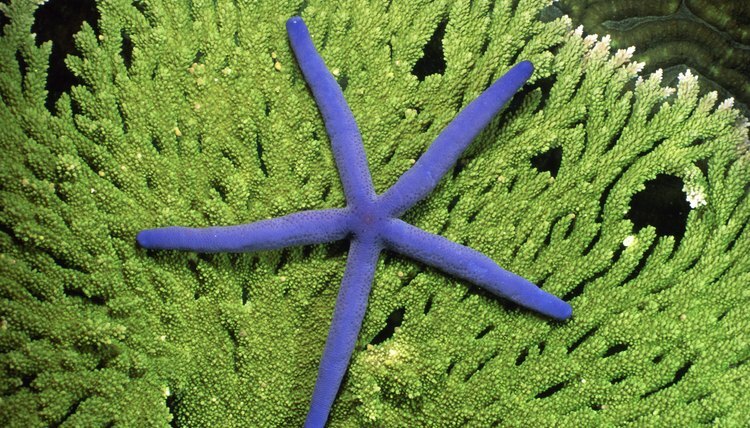 Advanced Aquarist: Aquarium Invertebrates: Sea Stars -- Linckia Spp.